Low-Energy Buildings: Solar Thermal, PV or Heat Pump? What is the best way to supply heat and power to low-energy buildings? Although there is no single answer to this question, solarthermalworld.org simulated the installation of a solar thermal unit, a PV system, a heat pump and a gas boiler in a low-energy house in southern Germany. The results show that solar technologies are significantly more profitable than heat pump systems. The largest solar field – consisting of 10 m² each of PV and solar thermal combined with a gas boiler – has by far the lowest cost (EUR 35,876) over 20 years in operation. On behalf of solarthermalworld.org, Vela Solaris, a Swiss-based software company, used its planning application Polysun to simulate the output of several PV and solar thermal installations based on the Würzburg site in Germany (irradiation: 1,095 kWh/m² and year), a south-facing system with a 40° slope and 10 m² of gross solar surface (regarding solar thermal, this means 9 m² of aperture area). Energy was consumed to heat 150 m² of space, provide 200 litres of hot water per day and supply 3,500 kWh of electricity. The tank held 1,200 litres in the case of solar thermal, and 600 without it. To calculate economic viability, a gas boiler was used as the standard system, for which cost was set to zero. Air-water heat pumps would add EUR 6,000 to the default value. The average cost of a 10 m² solar thermal unit was assumed to be EUR 6,000, including installation, an amount that was reduced by EUR 750 or half the price of the storage tank, which would be installed for hot water preparation in any case. A 1.5 kW PV system (equalling 10 m²) was thought to cost 2,700 – including installation – based on a price of EUR 5,400 for a 3-kilowatt unit (see sources in footnotes). The calculation also factored in subsidies from the German market rebate programme (see the table below). No costs were added for additional heat storage. Prices were assumed to match increases in system sizes for smaller or larger solar areas and rise by 3 % each year. The gas price was set to 0.07 EUR/kWh, the one of electricity to 0.29 EUR/kWh, whereas the interest rate was set to zero. Grid feed-in for surplus solar electricity was priced in at 0.12 EUR/kWh. A large solar thermal installation produces the highest energy yield, slightly above 5,000 kWh per year for 10 m² of gross collector area. A heat pump is used as backup, just like the gas boiler, meaning it does not influence the solar gains. In contrast, a 10 m² PV system yields around 1,500 kWh of electricity. Based on energy yield per m², solar thermal is more than three times as efficient as PV. A 10 m² solar thermal installation can reduce the fuel use of the gas boiler by more than 4,000 kWh, resulting in 15,297 kWh to meet a building’s energy needs (gas and electricity combined). The heat pump more than doubles power consumption, pushing it to 8,269 kWh (instead of 3,514 kWh). This can be countered by a PV system, which can produce part of the electricity on site. Combining PV and heat pump will reduce grid electricity requirements to 7,197 kWh. In other words, about two-thirds of the generated electricity can be used for the building, whereas the rest will be fed into the grid. The lowest energy consumption level for fuel and electricity – a mere 5,872 kWh – requires a combination of all three technologies, namely heat pump, PV and solar thermal. Heat pumps usually lead to energy consumption totals below the ones of gas boilers. Even without solar, buildings with a heat pump require only 8,269 kWh per year, which is far lower than even an installation consisting of 10 m² of PV, 10 m² of solar thermal and a gas boiler would need (13,808 kWh). Of course, one will have to account for the primary energy factor of electricity. Currently, this factor is 1.8 in Germany, meaning each kWh of electricity requires 1.8 kWh of primary energy. The same factor is 1.1 for natural gas. Results from selected Polysun simulations. ST is short for solar thermal, PV for photovoltaics. *The gas boiler is used as the standard system at zero cost and its price is subtracted from the cost of the heat pump. The net present value is the most comprehensive solution for comparing economic viability. As described above, it considers all investment and operating costs, energy price developments and interest rates. The simulations have shown the largest solar field with 10 m² of PV, 10 m² of solar thermal and a gas boiler to have by far the lowest cost (EUR 35,876) over a 20-year lifetime, even though this solution is capital intensive at EUR 8,050. The combination of PV and gas boiler has turned out to be the second most cost-effective solution, resulting in a net present value of -38,152 EUR over 20 years, but at attractively low investment costs. The most expensive solution is a heat pump without solar technologies, at a net present value of -53,963 EUR. 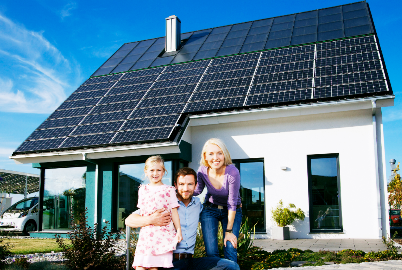 In general, all solar and heat pump combinations are more expensive in the long run than solar plus gas boiler.